Artist and scientist John V. Muntean has spent years crafting what he calls “magic angle sculptures.” While these sculptures look like a somewhat random assortment of abstract shapes and curves, they are actually highly calculated creations. When you shine or project a light at them against a surface like a wall at the “magic angle” of 54.74º, recognizable figures such as animals appear. Now that he’s moved from building with wood to stacking and arranging thousands of LEGOs, he’s building structures that appear outwardly like your child took apart her LEGO Death Star and tried to rebuild it without looking at the instructions manual. In the right light, however, one of his creations morphs from a butterfly to an airplane to a dragon simply by turning the sculpture around on a single axis. The other changes from a knight to a mermaid to a pirate ship. From the video, Muntean appears to use some sort of computer program to calculate how these innovative designs should be constructed, then builds them by hand. However he does it, Muntean’s creations show that there’s much more to these abstract-looking sculptures than meets the eye. Artist and scientist John V. Muntean has spent years crafting what he calls "magic angle sculptures." While these sculptures look like a somewhat random assortment of abstract shapes and curves, they are actually highly calculated creations. When you shine or project a light at them against a surface like a wall at the "magic angle" of 54.74�, recognizable figures such as animals appear. Now that he's moved from building with wood to stacking and arranging thousands of LEGOs, he's building structures that appear outwardly like your child took apart her LEGO Death Star and tried to rebuild it without looking at the instructions manual. 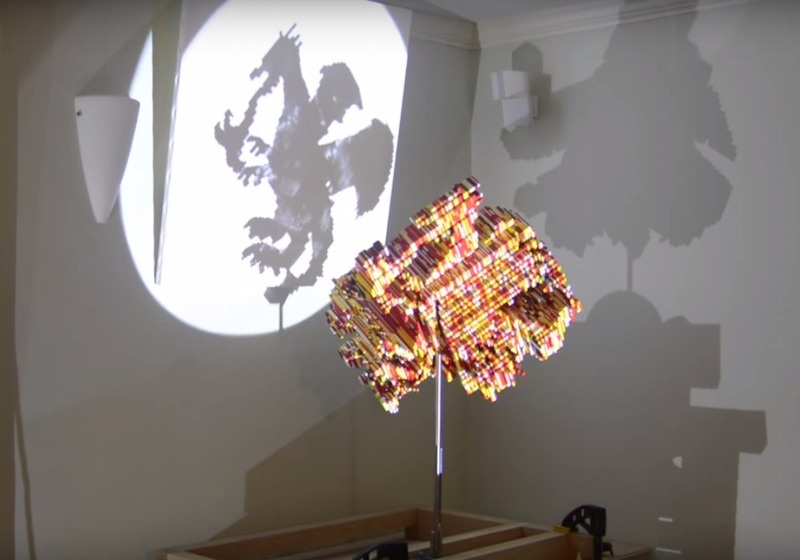 In the right light, however, one of his creations morphs from a butterfly to an airplane to a dragon�simply by turning the sculpture around on a single axis. The other changes from a knight to a mermaid to a pirate ship. From the video, Muntean appears to use some sort of computer program to calculate how these innovative designs should be constructed, then builds them by hand. However he does it, Muntean's creations show that there's much more to these abstract-looking sculptures than meets the eye.